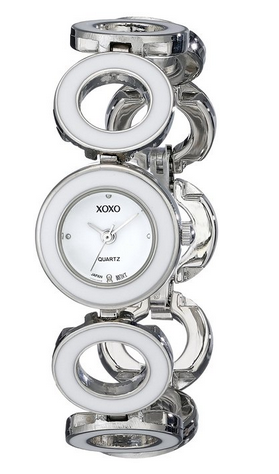 XOXO Silver-Tone and White Enamel Watch Only $14.91! You are here: Home / Great Deals / Amazon Deals / XOXO Silver-Tone and White Enamel Watch Only $14.91! You need a funky watch for the summer to highlight your tan! This XOXO watch features a round white-enamel open-link bracelet with jewelry-clasp closure and a logoed white dial! Get the XOXO Silver-Tone and White Enamel Watch for Only $14.91 from Amazon.com! Qualifies for FREE shipping on orders of $35+!